Makara Sankranthi is celebrated in various styles in different regions of India. 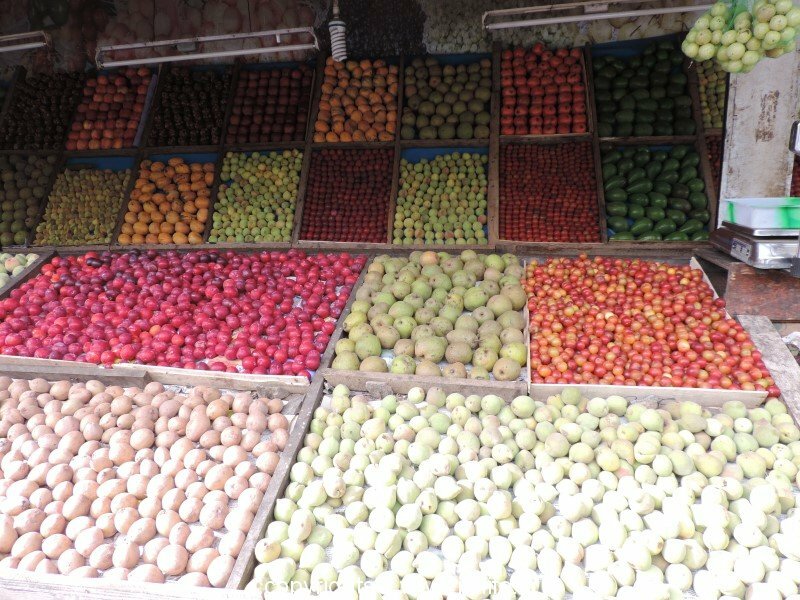 In Andhra Pradesh this festival is called as “Pedda Panduga” meaning “big festival”. It is celebrated for 4days known as Bhogi Panduga, Shankranthi and Kanuma. 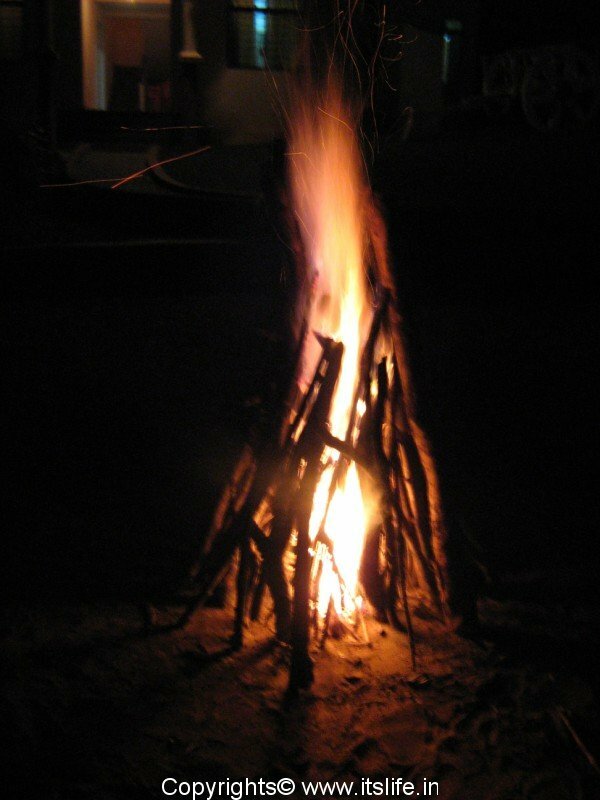 On Bhogi Panduga people wake up early and build a bonfire using old broomsticks, mats, paper and firewood signifying the end of evil. The courtyards are cleaned and beautiful muggulu/rangoli patterns are drawn and decorated with marigold flower stuck on cowdung balls. Everyone at home wears new clothes. The next day is Shankranti, and the sweet dish “Sakkare Pongal”, which is Jaggery rice is prepared and offered to the gods. 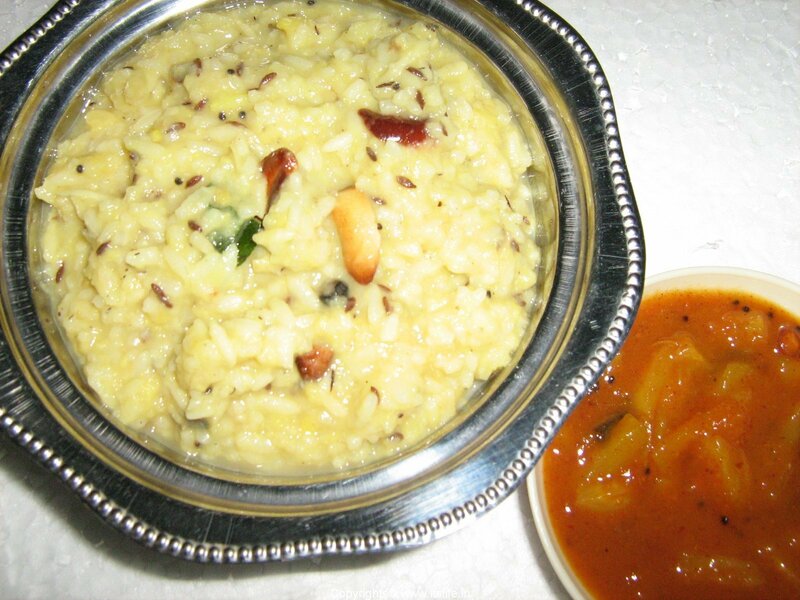 On this day other dishes like Puliharam/Puliyogare, Ariselu, Kajjikayalu, Laddoo, Jantikalu etc., are prepared. 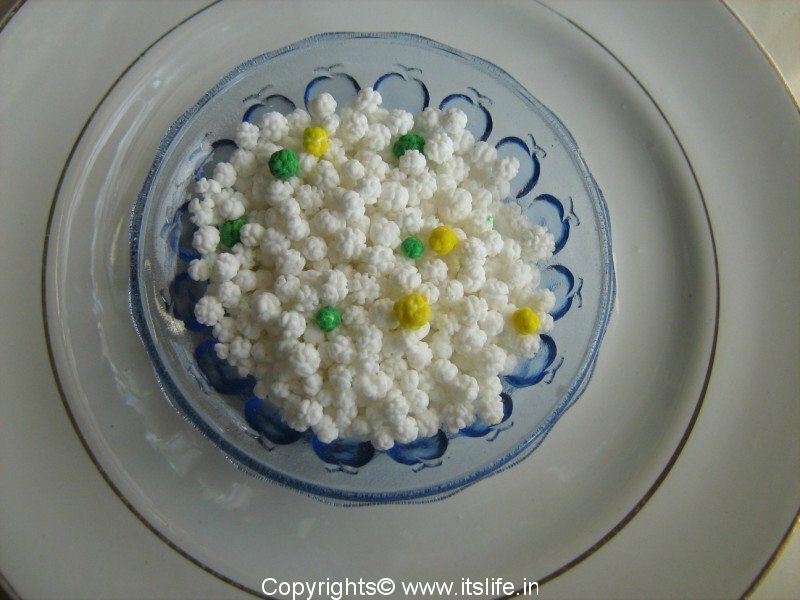 In the evening the children in the house will be made to sit and a mixture of Puffed Rice, Berries, Sugar Candy, Coins are mixed and poured over their head and an aarathi is performed. The neighbors are invited to participate in this ritual. This is done to drive away the evil eye. 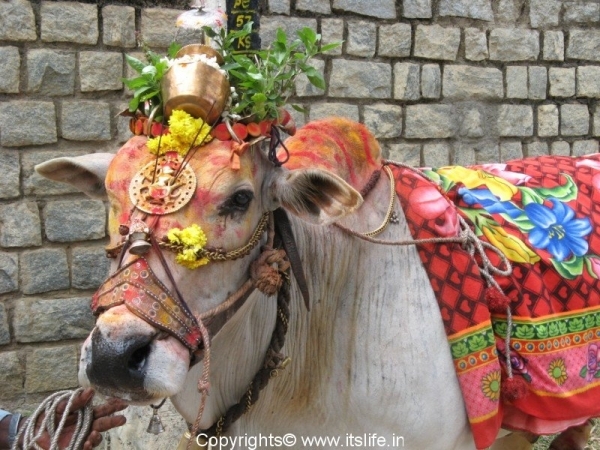 The third day is Kanuma, wherein the bullocks are decorated and worshipped and taken in a procession. The fourth and final day is Mukanuma where people socialize and go out on picnics. In Assam the festival is called as Bhogali Bihu or Magh Bihu; Bhogali means feasting. It is celebrated grandly in Assam for two days and is dedicated to fire god. The first day is known as Uruka. On this day youngsters build ‘Mejis’ or ‘Bhelaghars’ (bonfires) using bamboo and wood pieces in farmland or open spaces. People sing bihu songs and dance bihu dance around it. The next day, which is Magh Bihu, people throw rice cakes and betel nuts into the ‘Meji’. On this day, people visit relatives and share Rice flakes and Sweet Rice cakes. It is called as Til Sankranthi in Bihar, where people prepare Laddoos and roasted grains is eaten with Jaggery/Molasses. Roasted Til/Sesame Seeds is distributed among friends. A fair at Mandar hill is held in honor of the hill, which is mentioned in the ancient stories. Using the king of snake Sheshnag as the rope the hill was used by the gods and goddesses to churn the sea. This fair attracts a lot of people and they take bath in the Papaharini pond to wash away their sins. The Gujaratis celebrate Makara Sankranti as Uttarayan for two days by flying kites and preparing dishes like Tal Sankadi/Sesame Seeds bar, Jalebi, Undhiya and Groundnut Chikki/Peanuts bar. The sky is dotted with kites of all colors and shapes and people enjoy cutting the kites of others. “Kapyo Che” rings through the air meaning, “I cut the kite” whenever a kite is cut. “Uttarayan” as in other places is considered auspicious and on this day pandits/scholars give scholarships to students for higher studies in astrology and philosophy. 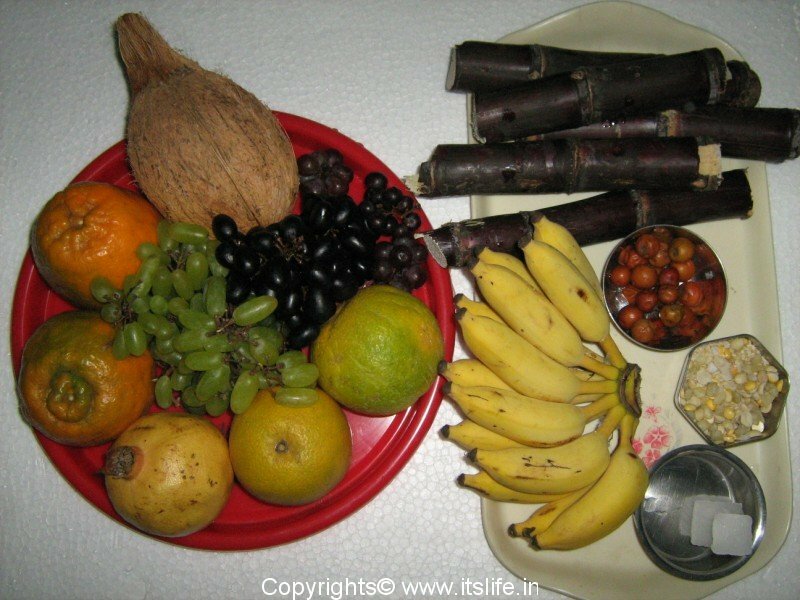 The next day of Sankranthi is known as Vaasi Uttarayan, which signifies the beginning of a good year. In Karnataka this festival is known as Makara Shankranthi and is celebrated for 2 days. 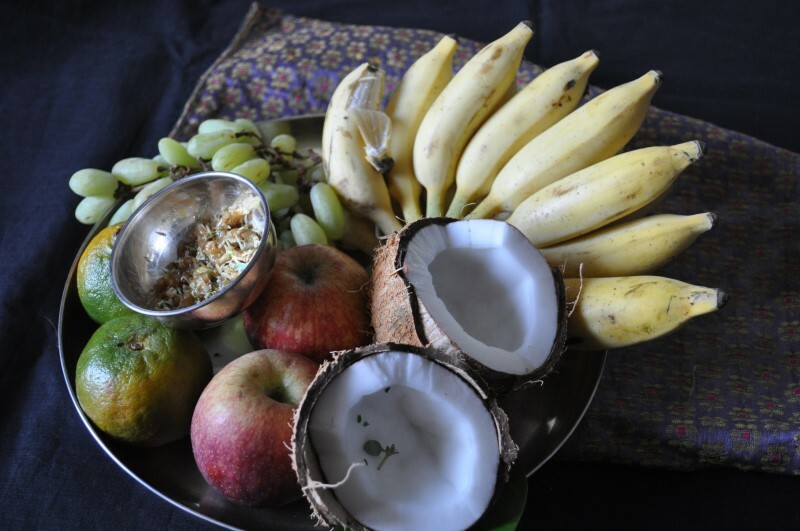 The first day is Bhogi and on this day people take oil head bath and the delicious Huggi and Gojju is prepared. This is a rice dish prepared using Rice and split Green Gram with spices. In North Karnataka Sajji/Bhajra Roti is prepared on Bhogi. On the next day special pooja is offered to the gods and a mixture “Yellu” is prepared using Sesame Seeds, Jaggery, Groundnuts, Fried Gram and Coconut and offered to the gods along with Sakkare Achchu/Sugar dolls, Sugarcane, Banana, Elachihannu/Jujube, Kusuri Kalu/Sesame Seeds coated with sugar. 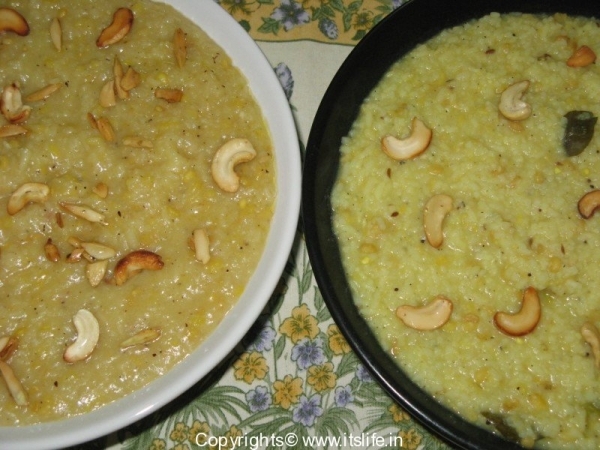 A Sakkare Pongal/Sweet rice is prepared and relished by one and all. In the evenings people wear new clothes and distribute Yellu, Sakkare Achchu, Sugarcane piece, Banana, Elachihannu to friends, neighbors and relatives. On the same evening children aged 5 and below in the house are dressed up in ornaments made of Kusuri Kalu and are made to sit on a mat and a mixture of Puffed Rice, Berries, Chocolates, Silver/Gold items, Sugar Candy, Coins are mixed and poured over their head to their delight. This ritual is known as “Kari Yeriyodu” and an aarathi is performed. The neighbors are invited to participate in this ritual. This ritual is performed to drive away the evil eye. In the evening the farmers decorate their cows and bullocks and worship them. They take them out on a procession and make them jump over fire. 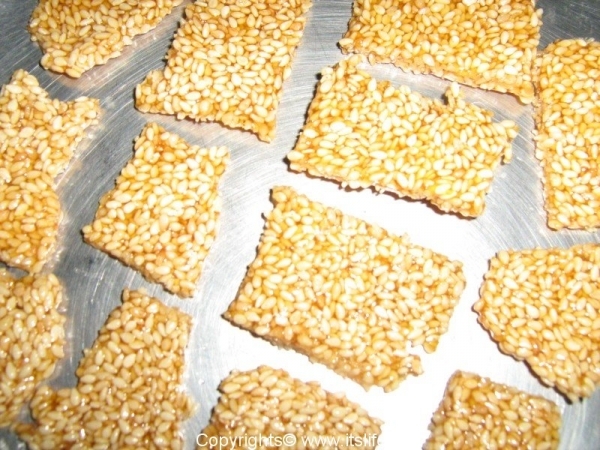 In North Karnataka people exchange Kusuri Kalu/Sesame seeds coated with sugar and greet one another with “Ellu bella thindu, Olle Maathu Aadu” , which means eat sesame seeds and jaggery/molasses and speak sweetly. In Kerala, this festival is known as Makara Sankranthi. The shrine of Shabarimala with the presiding deity of Ayyappa is thronged by millions of pilgrims on this day to witness the Makara Jyothi/Celestial light glow on the hills. In Bundelkhand and Madhya Pradesh, the festival is known as “Sukarat” or “Sakarat” and is celebrated with great pomp and merriment accompanied by lot of sweets especially made of Til and Gur. In Maharashtra on Sankranti day people exchange multi-colored tilguds/ Sesame seeds coated with sugar and greet one another saying ‘til-gul ghya, god god bola’ meaning ‘accept these tilguls and speak sweet words’. Til-polis/sweet sesame seeds bread are prepared for lunch. Children below 5 years are dressed with jewellery made with Kusuri Kalu/Sesame Seeds coated with sugar and an aarathi is performed. This festival is called as Lohri and it is one of the major festivals of Punjab. It is with great pomp and show. 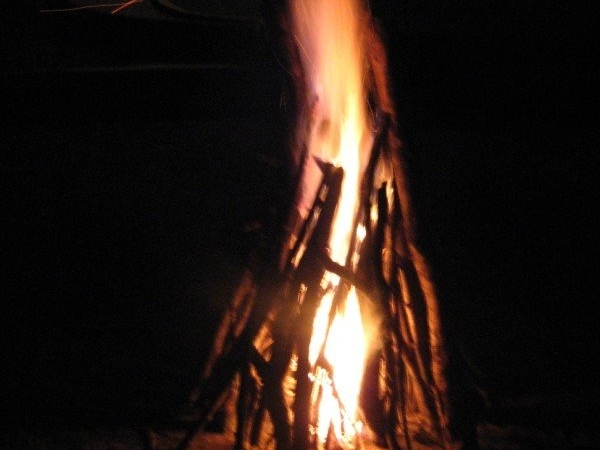 People socialize with friends and relatives, organize get together and build bonfire. People worship the god and circumvent the fire and distribute offerings. The feast includes Makki ki Roti and Sarson ka Saag. 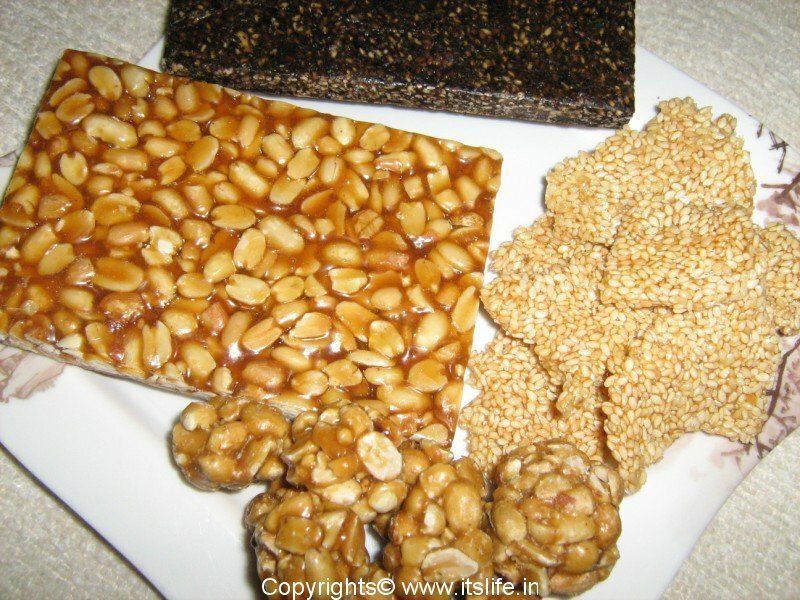 Til/Sesame seeds, Gazak/Sesame seeds bar, Gur/Jaggery, Moongphali/Peanuts, Phuliya and Popcorn are offered to god and distributed. In Tamil Nadu this festival is called as “Pongal” meaning “boiling over” and is one of the major festivals of the state. It is celebrated for 4 days known as Bhogi, Surya Pongal, Mattu Pongal and Kanum Pongal. 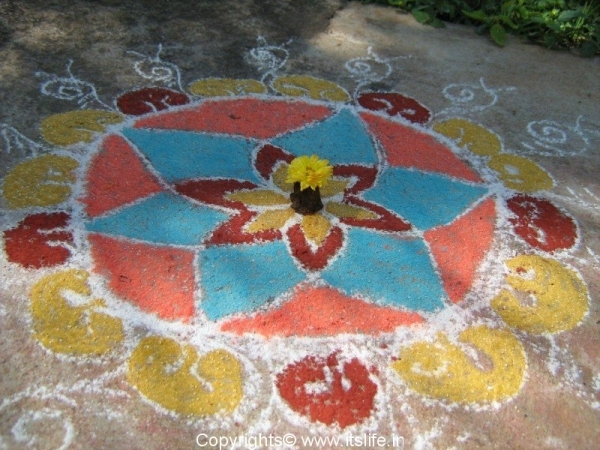 Houses are cleaned and large kolam/rangoli patterns are drawn in front of the house, and new clothes are bought. 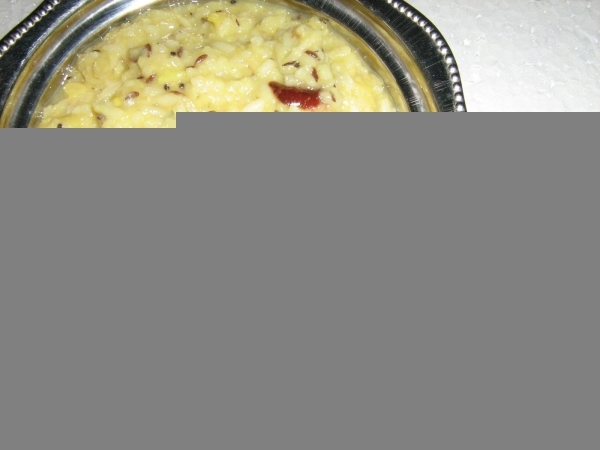 On the second day i.e., Surya Pongal day a sweet called “Sakkare Pongal” is prepared using Milk, Rice and Split Green Gram. The Milk is made to boil and spill all over the vessel. People meet relatives and friends and exchange sweets and savories. On Mattu Pongal day the cows are worshiped and decorated. The last day i.e, Kanum Pongal people go out on picnics with family and friends. In Uttar Pradesh, Sankrant is called “Kicheri”. Taking a dip on this day at Prayag in Allahabad where the holy rivers Ganga, Jamuna and Saraswati meet and flow together is considered very auspicious. Millions of people congregate on this day at the venue. Every 12 years once, the Kumbh Mela is held for a month during “Uttarayana”. The auspicious bath also takes place in Haridwar, Garh Mukteshwar and Rishikesh. West Bengal marks Makar Sankranthi by participating in the Gangasagar Mela/fair held on this day on the banks of river Hooghly in Kolkota. The Mela attracts people from all over India to take a dip in the river. This is the place of confluence of river Ganga and Arabian sea and this is the day that river Ganga is believed to have merged with the sea after liberating 60,000 ancestors of King Bhagirath. Thanks for the comment. Keep visiting. Happy Makar Sankranti!!! Very nice compilation on Sankranti and nice to know how it is celebrated in different parts of India. Do you know how they make Kusuri Kalu(Sugar coated sesame seeds)? We do not find them here in USA. Rajesh Mitra – Thank you, do visit again. Kavita – Happy Shankranthi. My mother knows how to make Kusuri Kalu, I will post it by next year Shankranthi.